Volusia & Flagler County FL Auto Detailing… Experience Counts! Opti-Coat Pro offers protection for the exterior of your vehicle which will outlast any conventional wax or sealant on the market. It is a ceramic coating, much like a hand applied layer of clear coat on top of the existing paint. Opti-Coat Pro carries a 5yr warranty against oxidation or staining on all exterior painted surfaces. In addition, Opti-Coat is also applied to any exterior plastic and the wheels to ensure similar protection for those parts of your car. 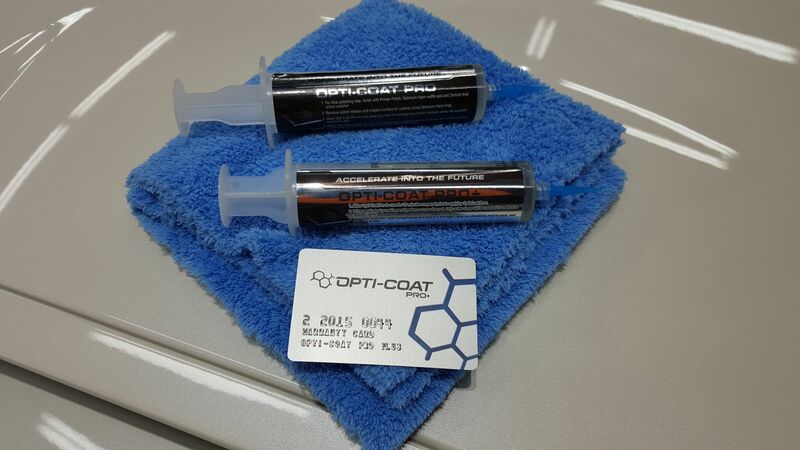 Once applied, Opti-Coat Pro can only be removed through machine polishing or sanding. It is resistant to detergents or solvents so it will protect over the life of your vehicle. A more affordable option is Optimum “Paint Guard”. This product carries a 3yr warranty. This is often a good match for leased vehicles. Installation of any of these 3 coatings is now recognized on CARFAX vehicle history reports! It will appear alongside other maintenance records such as oil changes to show that you have properly cared for the vehicle both mechanically and aesthetically. Mr. Sparkle Detailing is proud to be Volusia County’s authorized installer for Opti-Coat Pro and the full line of coatings from Optimum Polymer Technologies including Opti-Guard Leather & Fabric. Any contamination or defects in the paint must be removed prior to coating application. Even new vehicles often have light swirls, scratches and water spotting. These imperfections can be seen in direct sunlight, especially on a dark colored car. Paint correction (machine polishing) is needed in order to restore a near perfect finish as was intended from the factory. The condition of the vehicle determines the extent of the paint correction process. We recommend an annual maintenance of the coating including surface decontamination (clay bar) but there is NOT any spray sealant required to maintain the release properties of the coating unlike some competitors on the market. Ceramic Coatings, Paint Protection Film, Exterior Auto Protection, Interior Leather or Fabric Stain Protection as well as Car Detailing and Truck Detailing for Deltona, Daytona, Ormond Beach, New Smyrna, Deland, Port Orange, Flagler, Palm Coast, Ponce Inlet, Spruce Creek and all of Volusia and Flagler Counties in Florida!